What are Salaries for English Teachers in Latin America? Salaries for English teachers in Latin America will vary from country to country mostly depending on the cost of living in the given country. With that said, as a general rule of thumb for the region, English teachers should expect to earn a salary large enough to live a middle class lifestyle by local standards, and for the most part, break even after expenses. That means you will typically make enough money to cover your expenses (rent, transportation, food, phone, utilities, etc.) & to enjoy going out and traveling on weekends, but you shouldn't expect to save substantial sums after expenses. Key Point! The cost of living is substantially lower in most Latin American countries compared to native English speaking countries like the US, Canada, Australia, and the UK. So even though your salary will tend to be lower, but you will still enjoy a good standard of living. Also, any hard currency (dollars, euros, etc.) that you bring with you will have strong purchasing power in most Latin American countries and will "go farther." This means that your start-up costs & travel will often be much cheaper. 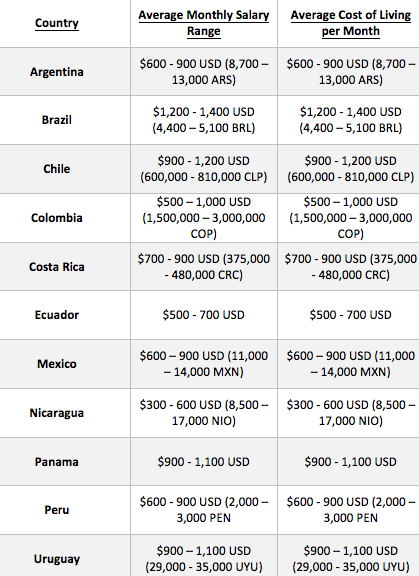 Below is a list of some of the more popular countries for teaching English in Latin America with typical salary ranges along with the living costs. English Teaching Salaries & Living Costs - Comparing "Apples to Apples"
Looking at the chart above, you may see that English teachers in Peru or Mexico may only make the equivalent of $600 or $900 and think, "man, how can anybody support themselves on that?" Monthly rent for 1-2 bedroom apartment in Nicaragua typically costs $75 - $150 or in Costa Rica, $200-$300. In a desirable neighborhood in Chicago or San Francisco, you will probably have a hard time finding a small studio for less than $1000. Bogota, Colombia - Teaching English through the Fulbright Program in the Colombian capital of Bogota, ITA grad Cailey Oehler pays the equivalent of $135 USD in monthly rent, $15 USD for her phone (with a good data plan) & local buses are under 75 cents a ride. Cuenca, Ecuador - ITA grad Lindsey Ingwersen says that in the historic mountain city of Cuenca, you can eat a 3-course lunch for $2.50, monthly rent is $150-$250 USD and you can ride the local bus for the equivalent of 25 cents. If you’re looking to help boost your income a bit while teaching English in Latin America, one option is to private tutor on the side. Another great option to earn extra money that is becoming more and more popular for our alumni every year is teaching English online. Many ITA grads are making $12-$18 (or even more) an hour teaching English by Skype and video conference to students as far away as China & the Middle East. 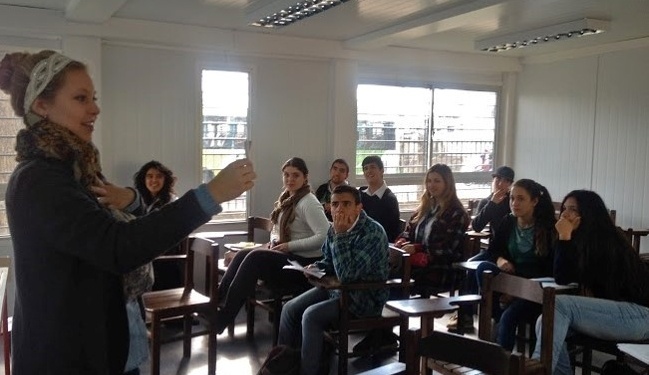 Want to Learn More about Teaching English in Latin America? 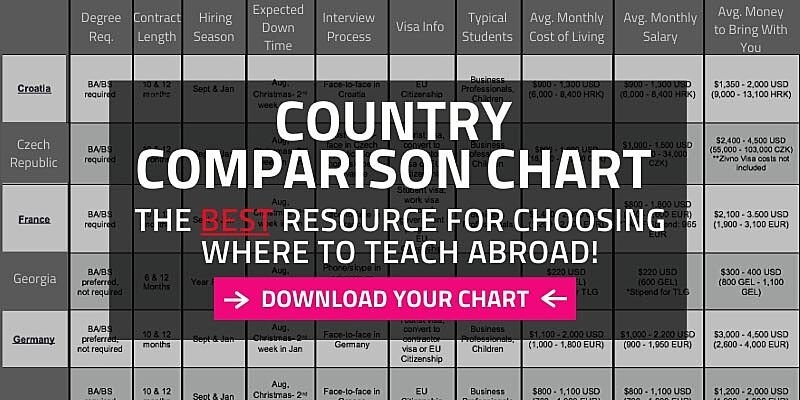 What Are Start-Up Costs for Teaching English Abroad? What Does it Mean to Break Even While Teaching English Abroad? Prior to joining ITA in 2011, Jeff spent two years teaching English in Seoul, South Korea. He used the money he saved while teaching in Korea to fund a year of travel in Asia and South America. Here in Chicago, Jeff can always be counted on to make a strong showing in ITA’s annual Halloween costume contest.